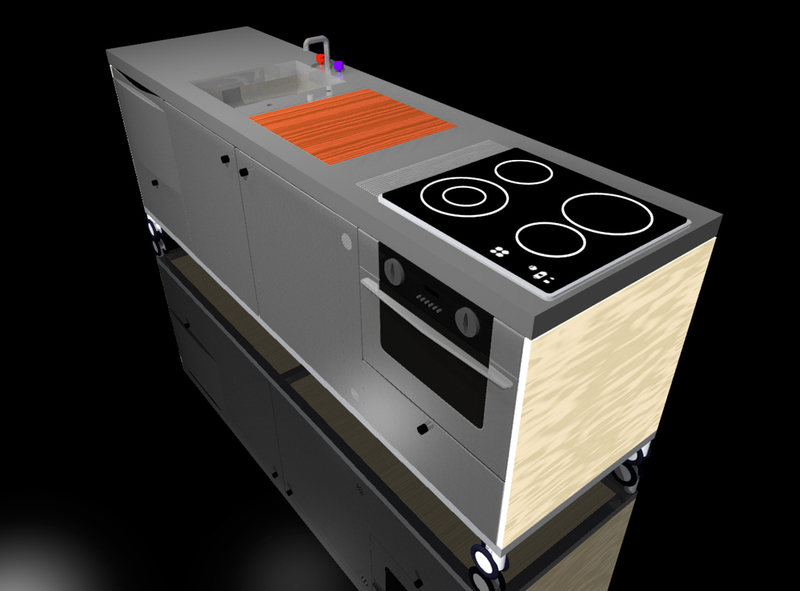 Imagine a kitchen as a large appliance: a loose docking of food storage, preparation, cooking and cleaning-up machines. They are all chosen by you, the cook, as a unique custom package; perfect for your needs. When you move dwelling, as we all increasingly do, you take it all with you. It’s all on casters. After all it has taken some years to assemble your perfect cooking package and the last thing you want to do is start from scratch again in somebody else’s kitchen. The machines are compact and designed for reduced environmental impact in operation. They are electronically linked to a central computer that monitors and reports on their operation and connects the kitchen to your local ‘Smart Store’ for shopping and reordering. The computer program connects the internal food inventory of the kitchen to the processes of purchasing food, researching new recipes and keeping of dinner party deadlines. Imagine a kitchen as a space not defined by a structure but by activity, a space designed to enhance the quality of the social ritual of eating. This kitchen is defined by a series of objects or tools around which people prepare food or mill in anticipation. It is a campsite. As urban densities are increasing there is a need to achieve a high standard of livability in a wide variety of spaces, from the small and irregular service or leftover spaces in existing dwellings to the vast tracts of amorphous open plan office space left vacant by corporate downsizing and decentralisation. These trends, combined with an increasingly nomadic lifestyle for many people require more flexible, portable and self contained solutions for domestic servicing. 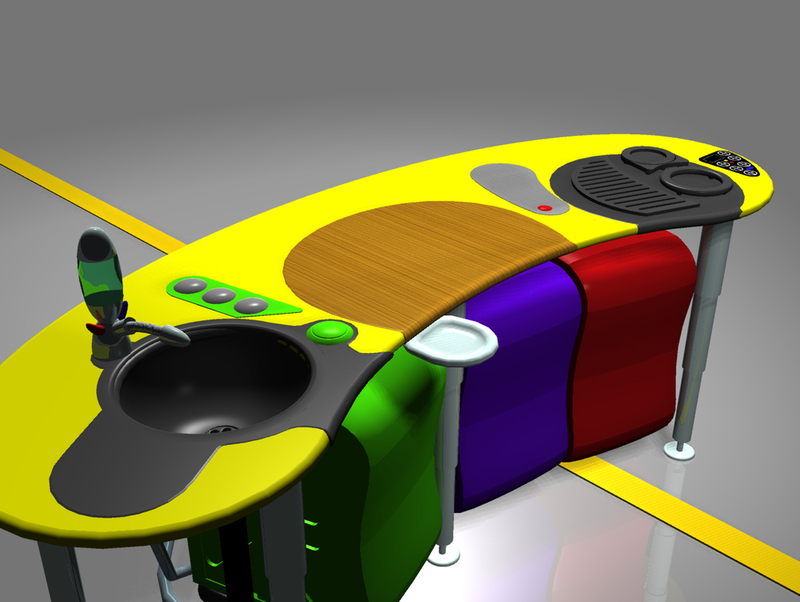 The Hyperkitchen project is a response to these social, economic and environmental changes. 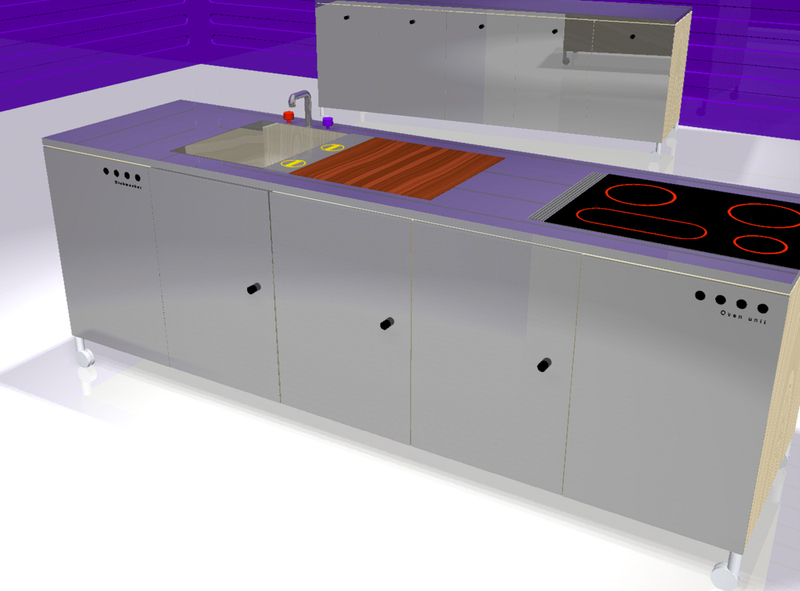 The Hyperkitchen is a system of compact interchangeable and upgradable, modular service units, loosely connected, that establishes all the functions of a kitchen without the need for an enclosing room. 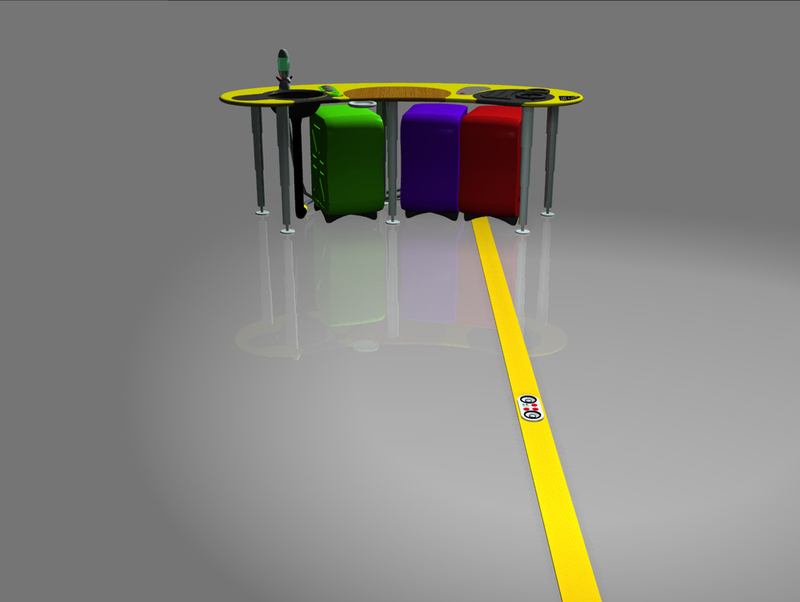 It is a self contained, mobile island, able to be inserted into any appropriately serviced interior space. At the core is a wrap-around work surface, somewhat like a car dashboard, on 6 telescopic legs for adjustable work height. The individual machines sit beside, over and under the work surface to create a kind of linear factory for food preparation from freezer to consumption. The technology required for all the machine variants shown already exists, although not necessarily in the kitchen. A number of two meter high mobile pantry and crockery-draw units park to form a convenient back-wall of storage. Docked into the pantry is a Smart Kart. This contains refillable and removable storage capsules for bulk wet and dry food stuffs. The supermarket or ‘Smart Store’ where you shop no longer packages most food stuffs. The store is filled with dispensing machines like petrol-pumps for food. Product advertising including videos wrap the dispensing units. Your smart creditcard gets you access to the dispensers, debits your account and loads up an inventory of purchases for you to download at home. Light translucent roll-away screens are included for space division and visual separation, if required. The screens contain active noise-damping units similar to those developed by Bose in the United States for pilot’s and passenger’s headphones. This way acoustic privacy can be maintained without space or weight penalties. Flexible umbilical cables connect the Hyperkitchen to electricity, fresh water and sullage services with a quick-fit Drybreak universal coupling [ similar to those used in Formula-1 motor-racing refuelling ]. It does not require professional assistance for hook up. The coupling sockets for these services are mounted in the floor. The materials used to surface the modular elements range from brightly coloured hardened plastics to natural wood. The organic forms and bright colours are a deliberate departure from the tyranny and antiseptic sterility of the prevailing hospital and laboratory metaphors in kitchen design. The kitchen is concerned with more than hygiene. It is concerned with participation. Your kitchen system can be continuously refined, expanded and upgraded to suit your personal requirements without fear of losing your investment. While all the elements are mass-produced any individual combination is unique. The centrepiece of the kitchen is a bright curved, biomorphic floating work surface on 6 telescopic legs that are easily adjustable in height. At one end is a circular, energy efficient, Fluorocarbon-free fridge, opening vertically. Along the main work surface is a put-down and preparation area between the fridge and the sink and a swirl-sink with built in water jets to rinse vegetables and dishes more effectively with less water, like a spa. Behind it is a programmable tap for different water temperatures with a built in hi-pressure water filter. The clear filter head allows you to preview your drinking water. The hot and cold taps are flexible rubber stalks. Four disposal chutes beside the sink are for separated waste disposal. This leads directly to a roll-away compartmentalised waste capsule below. The compartments are designed for separated recycling. The soft rubber stoppers pop out when pushed down. The compartments are self-sealing to prevent odours permeating the area. Slide-away bench-mounted digital scales are included for weighing food stuffs. 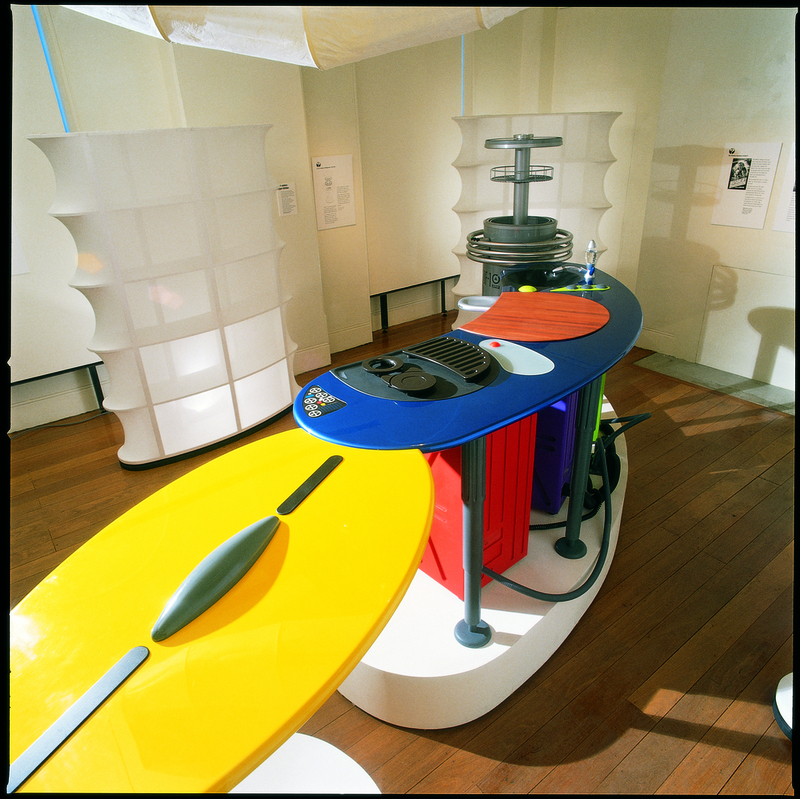 The main preparation area is fitted with a traditional Jarrah chopping block. This is removable and replaceable. A surface embedded electric motor is included to power food processors and juicers, etc. The motor shank projects from a heat resistant plate used to park hot utensils. A ceramic, fully programmable, electromagnetic cooking surface sits at the end of the main work surface. It has an integrated drip tray at the leading edge and is completely smooth for wipe down cleaning. The cooking tools, such as barbecue grillers, wok rings or high speed heat rings are all interchangeable to facilitate any cooking style. These cooking tools are easily removable from the cooking surface and can be washed in the dishwasher. The cooking tools are operated by the touch sensitive control panel to the right of the cooking surface. The control panel can be configured in different ways to suit the cooking method used. A removable and pivoted breakfast-bar projects from the end of the central island for food preparation and fast eating. This can be swung around to create an enclosing preparation area or swung back out of the way. In the centre of this is mounted a horizontal ‘lazy susan’ style rotary condiments pallet. At either end is a contact activated heating strip for warming prepared food. This can also be used to activate the new generation of fast-foods that cook in their own bags via the heat strip and ‘flower on opening to create instant nutritious and beautifully presented meals. The rich and intensely coloured graphic packages act as serving containers and add ceremony to the occasion. Below the central island work surface are a number of mobile systems An ultra-sonic dishwasher, which uses sound to shake the dirt free from the dishes, requiring less water and detergent. A compartmentalised waste disposal capsule with a front mounted LED display to alert you when the compartments are full. This capsule is rolled out for garbage collection. No further handling of the garbage is required. 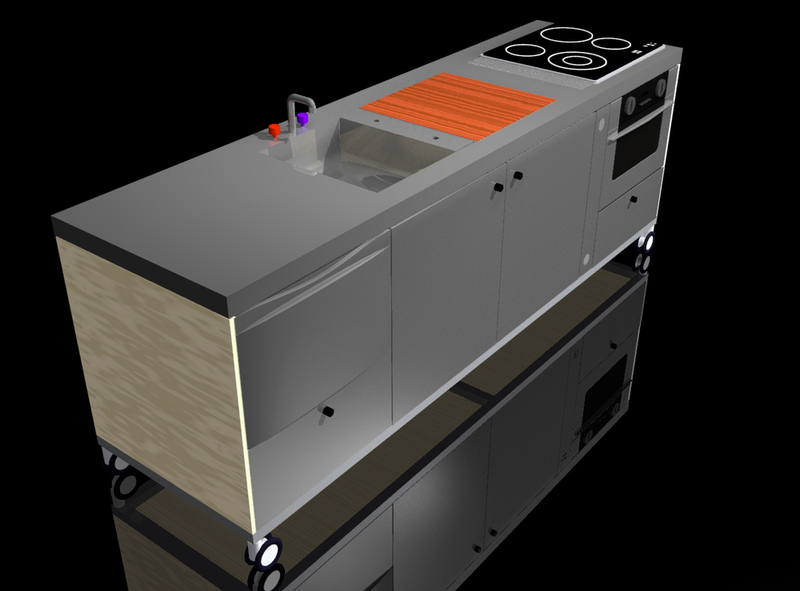 A rack mounted enclosed cooking unit. This contains a convection microwave-oven and a flash-bake oven, able to perfectly cook a pizza in 50 seconds [that’s cooked from scratch, not reheated!]. This unit is designed to contain other below bench cooking systems in the manner of audio equipment racks. Above the central island bench hangs a floating cloud [not shown] providing further services. These are a micro-herbarium and alfalfa garden with watering system and artificial light source, a condiments and dried herb dispensing unit, an overhead light source combing diffuse and adjustable spot lighting. 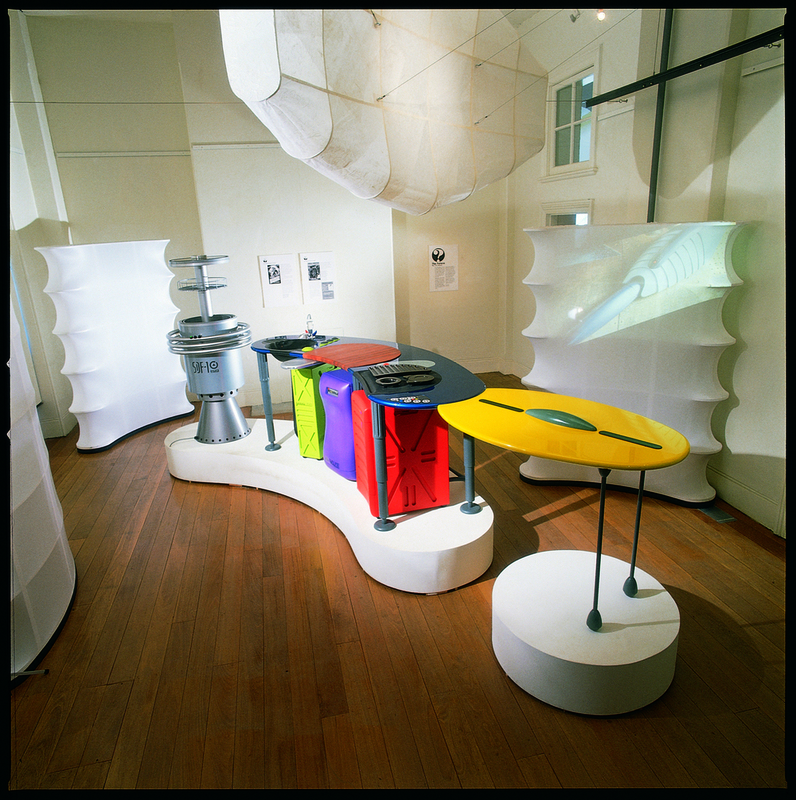 A retractable, interactive LCD screen suspended below the cloud provides access to the central kitchen computer. Electronically connected to this is a pen sized food-probe. Behind the central island sit the storage capsules. These include a mobile Crockery storage and display unit, a mobile pots, pans and lids storage capsule and a mobile pantry and larder with a built-in bulk wet and dry foods dispenser. This is removable. Called a Smart Kart , it has a fold down under-carriage, so as to function as a shopping trolley. It also locks into the boot of your electric city runabout allowing hands-free containment from supermarket to pantry. Purchase information from the ‘Smart Store’ on your swipe card can be directly entered into the Maitre’ D computer program to update your food inventory. A pod of tiny bio-machine scavengers, like electronic cockroaches eat dust and food scraps to clean up the kitchen. After sucking up food spills and dirt the Micro-scavengers wait for the ‘mother’ vacuum cleaner to pass by and transfer their meal. The machines are programmed to avoid light and noise, to protect themselves from being trodden underfoot and this also prevents them from getting in the way. When their batteries run low the Micro-scavengers seek the nearest power point to recharge. 1] Inventory of food stocks. Purchase-information from the ‘Smart Store’ on your swipe card can be directly entered into the Maitre’ D computer program to update your food inventory. The inventory is divided into refrigerated and pantry food storage, meat, vegetable and delicatessen food stuffs. Information on the quantities of food available can be imported into the recipe program. By storing patterns of use the inventory program will advise the household on impending shortages. 2] Recipe Book. This contains a vast store of recipes, able to amended, appended, removed and added to. The recipes can be accessed and grouped by alphabetic order, difficulty, length of cooking time, principle ingredients and number of people they serve. Whole new cookbooks can be entered from CD-ROM or downloaded. Each recipe displays both text and a “how to” video along with final serving and presentation suggestions. 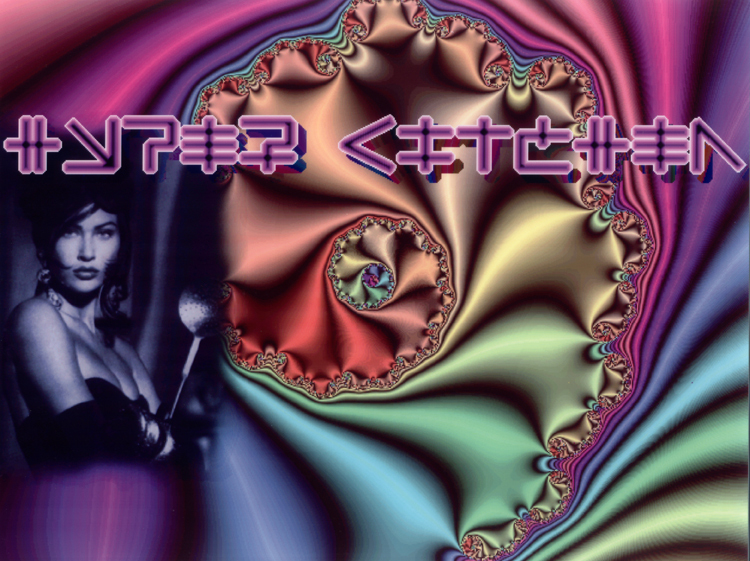 3] Nutrition. This contains nutrition and diet information including food stuffs and diet supplements. Recipes can be selected and diets can be formulated to conform to a desired regime. The relative nutritional values of food stuffs can be examined. The program can offer basic advice on health problems including possible allergic reactions and vitamin deficiencies. A pill dispenser can also be programmed from the computer. 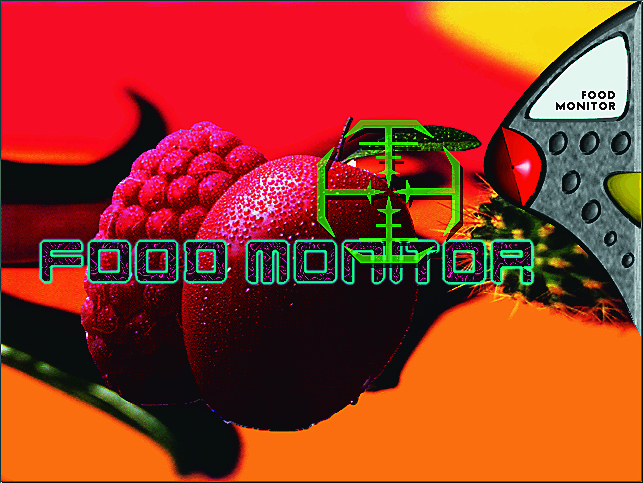 4] Food Monitor. This program contains an encyclopaedic store of information on available food stuffs; meats, vegetables, dried foods, liquids and condiments. Their appearance, weight, size, origin, flavour and usage is documented. The remote food-probe can be inserted into fruit, vegetables and other foods to determine their freshness and even to identify them. 5] Appliance Control. This program monitors and can control all the appliances in the kitchen. Dishwashers, stoves, ovens and cleaning equipment can be centrally timer controlled and you can receive a warning if any machine overheats or breaks down. This program controls the pod of tiny Micro-scavengers. 6] Entertainment. The computer also functions as a video phone, answer machine, VCR and Tv, music player and download portal. Prototype maquette made by: David Poulton.